Scoville is the scale of measurement of the pungency (spicy heat) of chili peppers. Mhz is what Green Lab are using to measure the effectiveness of our chilli aquaponic system, 30Mhz. Located in one of our 24 demo bays is a small scale aquaponic system, home to two bonito chilli plants, two red comets and a host of 30Mhz sensors. 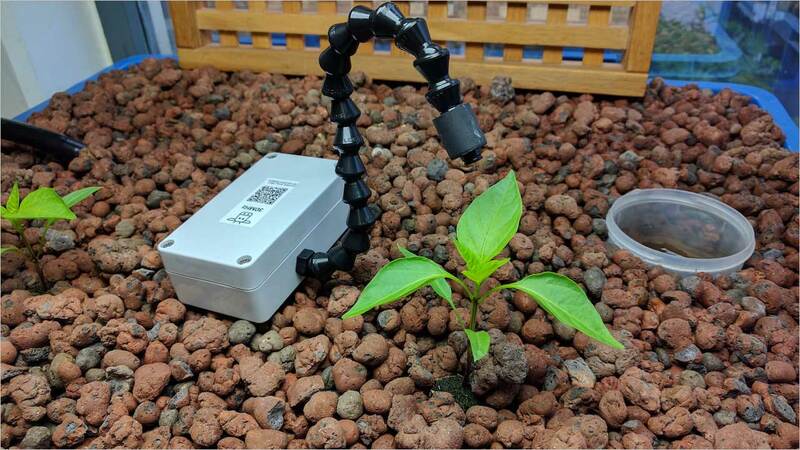 The sensors are tracking (in real-time) the humidity, temperature, leaf temp and light intensity of the growing environment, providing the Green Lab team with insight into the growing cycle. Data from the sensors can be viewed in a real-time web and mobile dashboard giving the Green Lab team access to critical environmental data; sensor units are also battery powered, making them very portable and also waterproof. We like. Over the coming months we’ll be adding pH and CO2 sensors as part of a year long pilot to embedd the 30Mhz sensor technology into a variety of lab projects; aquaponic, hydroponic, insects and algae. 30MHz believes that with technology and data, organizations of any size can innovate to become more efficient, sustainable and cost-effective. Using easy to deploy wireless sensors, we’re empowering businesses to turn metrics captured from the physical world into actionable insights at industry-scale. With the 30MHz Toolkit, we’re lowering the barrier to entry to industrial sensor technology. Our scalable and interoperable plug-and-play solution is designed for quick roll-out of sensors in the hundreds of thousands, and our dashboard makes data monitoring simple and user-friendly from any device.